August 3, 2019 | 11 a.m.-4 p.m. Delicious Food | Games & Prizes | Bounce House | Local Artisans | Live Music | Book Sale Featuring Deals & Rarities | Sweet Bread Sale | and more! Learn more about how this event brings together the Stonington community in support of the COMO in this profile by The Day. Be a part of the Village Fair! The Village Fair artisan show is a beloved part of the fair, attracting thousands of attendees. Apply to be an artisan vendor at this year’s fair by either completing the online artisan application or submitting a paper copy with payment to the Stonington Community Center at 28 Cutler Street. Be sure to download a copy of the application and fair regulations as well. Map of artisan vendor spots for 2019. The COMO has a limited number of 10’ x 10’ spaces available to purchase for local service businesses – first come, first serve. All applicants must submit the attached application to be considered for this year’s fair. Please note: the event will occur rain or shine; therefore, it is recommended that participants bring a tent for either shade or inclement weather. This opportunity is for businesses to share information about their products – you are not to sell products during this time. Please do not hesitate to contact the COMO at 860.535.2476 or development@thecomo.org with any additional questions. 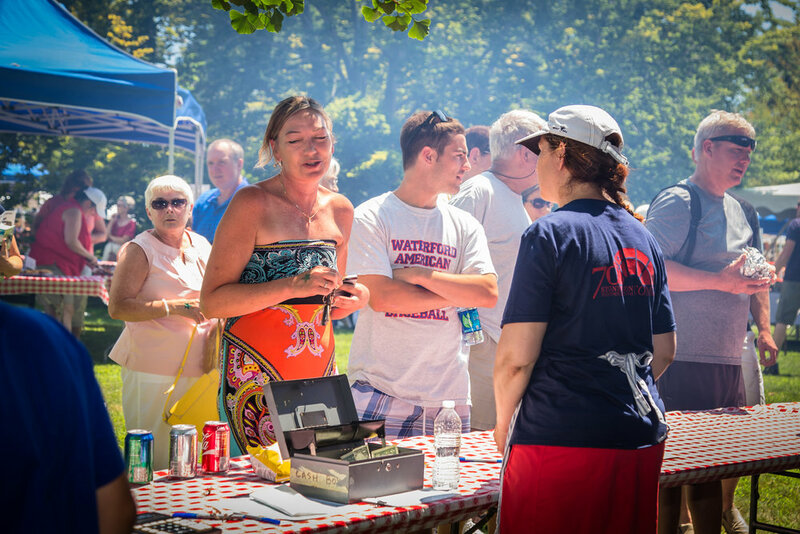 We look forward to another successful event and to having you as a part of the 67th Annual Stonington Village Fair. The COMO has ten (10) 10’ x 10’ spaces available to purchase for local non-profits – first come, first serve. All applicants must submit the application to be considered for this year’s fair. Please contact development@thecomo.org for more information. Please do not hesitate to contact the COMO at 860.535.2476 with any additional questions. We look forward to another successful event and to having you as a part of this year's Annual Stonington Village Fair! Each year, dozens of sponsors support this beloved event! Consider sponsoring this year's village fair and you'll be included in a marketing mix reaching hundreds of locals and tourists alike! Your support is greatly appreciated and helps this event to be a continued success. Want to increase the impact of your support and garner greater brand visibility at the same time? Consider becoming a corporate sponsor of the COMO! If you are interested in becoming a 2019 Village Fair sponsor or have questions, please contact development@thecomo.org.